NXP is driving innovation with its expanded cellular infrastructure portfolio of GaN and silicon laterally diffused metal oxide semiconductor (Si-LDMOS) products that deliver industry leading performance in a compact footprint to enable next-generation 5G cellular networks. Spectrum expansion, higher-order modulation, carrier aggregation, full-dimension beam forming and other enablers of 5G connectivity will require an expanded base of technologies to support enhanced mobile broadband connectivity, says NXP. With spectrum usage and network footprints, multiple-input multiple output (MIMO) technologies from four transmit (4TX) antennas to 64 TX and higher will be employed. 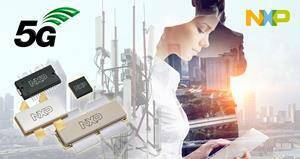 The future of 5G networks will depend on GaN and Si-LDMOS technologies, NXP notes. The breadth of the company’s RF Power technologies—which include GaN, silicon-LDMOS, SiGe, and GaAs—allows product options for 5G that span frequency and power spectrums with varying levels of integration. This wide array of options, combined with the products that NXP builds for digital computing, and baseband processing, makes NXP a unique supplier of end-to-end 5G solutions. 5G is more than low-band front-end modules and switches. NXP has all RF technologies to fully address and enable 5G — from wireless infrastructure to mobile devices to the gallium nitride technologies to make them happen. From a consumer perspective, We expect online gaming,movie streaming,augmented and virtual reality (AR/ VR) will leverage 5G’s dramatically improved throughput and low latency for quicker response times. Also other unique use cases such as immersive sporting events. To learn more, visit NXP at the International Microwave Symposium (IMS 2018) June 10-15 at booth #739 or at www.nxp.com/RF.